Five-song, fully-produced band EP released on vinyl and cassette. Currently unavailable. Nominated for a Washington Area Music Award (WAMMIE) in the Best Debut Album Category. Dave Goodrich was a drummer, percussionist, singer, songwriter, and producer for Mind's i. Additional members of Mind's i were Lenny Stearns on lead vocals and guitar and André Follot on bass and backing vocals. 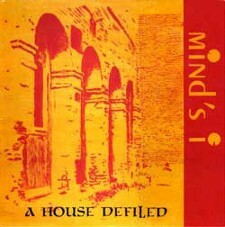 In 1988, the Washington, DC-based alternative pop trio Mind's i—for which Dave Goodrich was a drummer, percussionist, singer, songwriter, and producer from 1985 to 1990—released a fully-produced, 5-song band EP entitled A House Defiled on the BBTB Records label. The album was nominated for a Washington Area Music Award (WAMMIE) in the Best Debut Album Category. The album was arranged and produced by Mind's i. Mixed by Bill Plummer and Kevin Morales at Central Studio in Silver Spring, MD, the EP was also engineered by Bill Plummer. In addition to writng two of the songs—Dreams and Something's Wrong—Dave Goodrich created the cover art and concept. The cover art painting was based on the Mind's i photo that was taken in Georgetown and which appears on the back of the album. Jacket design was by Mind's i, and graphics were designed by Paula Fener. ...a safe bet for those with adventurous ears." "Assured harmonies add to the appeal of their five-song EP..."